How can cross country have a history? It’s such a simple sport. We race from here to there, regardless of what footing or obstacles are in the way. It has to be as old as humanity itself. And if you believed that, as I did before reading this book, you would be wrong. Cross country running in the way that we now know it came from a game called “hares and hounds”, a sort of a reverse anthropomorphism of the upper-class foxhunt, played by young men at England’s schools and universities in the 19th century. That is where Hutchinson’s book begins, and from there it goes on a wild run over hill and dale. It follows the development of the sport from quirky intramurals to university and club teams and national and international competition, as it spread out over the globe. Books exist to trace the history of running, and of track and field, and of marathoning, but until now none have traced the history of cross country. Hutchinson did a massive amount of research to unearth stories of long-forgotten athletes and races that illustrate the colorful history of a sport that still defies standardization, and he covers every part of it that you can think of (plus plenty you won’t until you read it). First-time author Hutchinson avoids the potential pitfall in an extensive work like this, a presentation that is encyclopedic rather than narrative. Fittingly for a book about cross country it’s long. It is organized by decades with a deep look at a feature race in each chapter. If there’s a criticism, it’s that the broad scope of the book allowed Hutchinson to occasionally miss minor details that would give a broader understanding (example: a runner identified merely as “E.A. Montague” is in fact Aubrey Montague, whose letters to his mother from the 1924 Olympics narrate Chariots of Fire). The book is best consumed like one of those epic Ken Burns documentaries: one episode at a time. The book has not yet hit the market and won’t until a few weeks after Christmas, but pre-order is available. If the runner on your shopping list is willing to wait a few weeks (even if that runner is you), I heartily recommend this book as a gift for fans of every stripe. I asked Hutchinson a few questions about his efforts. Squire: This was a massive effort of research and writing. What inspired you to take it on? Hutchinson: In 2012 I was in my fourth year as a high school history teacher (simultaneously pursuing a Master of Liberal Arts at Stanford where they needed an “undiscovered topic of personal interest” for my dissertation), and I was coaching a team of 60 cross-country athletes for the school. In November that year, as I was preparing the team yearbook for our cross-country season, I wanted to include some sport history for context. Couldn’t find anything definitive. A few hobbyist’s websites, Wikipedia had about three total sentences (a stub! It even mentioned cross-country in the Olympics, which was new info to me, and sounded awesome), and a few really enticing PDFs on the LA87 site. I was shocked. I had grown up reading the “Illustrated History of Football” and the like, but figured every major sport had to have a volume sitting on the library shelf. There wasn’t one for cross-country. So I decided to take time away from teaching, use my savings to live frugally, start at Stanford’s library, and become the expert needed to write the story myself. What transpired over the course of the next few years was this book, and candidly, now seeing how much time and effort was needed for research, I know why it never happened before. I wrote it chronologically, and each decade seemed more extensive than the last. Many Friday evenings and weekend afternoons were sacrificed spent writing, and I eventually came back to teaching…Supplementing that job working the front desk at a local gym at 5 in the morning so I could spend a few hours before school writing without being disturbed too much. There were a lot of 12 hour days, but the outcome was absolutely worth it. Squire: You said you were surprised to discover that cross country had once been in the Olympics. What were some of the bigger “gee, I didn’t know that” moments in research? And what were the most epic races that you never knew had taken place? Hutchinson: I quickly learned that USA Track and Field (and therefore most reputable bodies along with them) had erroneously recorded the first U.S. Cross Country National Championship as being in 1890. This has been the result of Spalding’s Sports Almanac a short time after the turn of the century, and they unknowingly wiped out seven years of official championships prior to that year. It wasn’t until I started at that year of the championship and discovered in news articles that it was the seventh year of running it that it caused me to go back and verify. That time period also had some gaps in the championship record, which were the result of a lawsuit between the organization that hosted the “Team” national championship in the spring, and the New York Athletic Club, which hosted the “Individual” championship in the fall. The end result destroyed both iterations of the event and it disappeared in the 1890s for awhile. Very reminiscent of the talk about Foot Locker and NXN by today’s audience, although there have been no lawsuits… just further proof that history always repeats itself. One race-related nugget uncovered was the secret success of Emil Zatopek as a cross-country runner, which had been almost completely forgotten up until a few years ago. His appearance at the “Cross de L’Humanité” in France saw upwards of 70,000 spectators, and Zatopek didn’t always win! (The biggest shock of all). His appearance in XC, along with Kip Keino and Jim Ryun also running 10K XC during their prime were surprising tidbits that had been overlooked before. Squire: These days runners tend to specialize even more than they used to, but almost no one specializes in cross country. Was there a runner you discovered who was dominant in cross country but otherwise very little-known? Hutchinson: Pat Porter fit this profile. Here was a guy who ran NCAA DII for Adams State, came up at a time with the Salazars and the Herb Lindsays and the Craig Virgins and absolutely DOMINATED cross-country. For nearly 20 years he was a podium finisher domestically, and internationally did well despite facing raw African talent and very good European talent. No one else came close. These days you’ve got Chris Derrick, Garrett Heath, and to a lesser extent Joe Gray and Max King— guys who train in the mud and trails and throw down on the tracks and roads occasionally, but aren’t winning major marathons or Olympic medals. The U.S. women have done better to preserve the ideology that cross-country is a worthy competition tool to find stardom elsewhere. 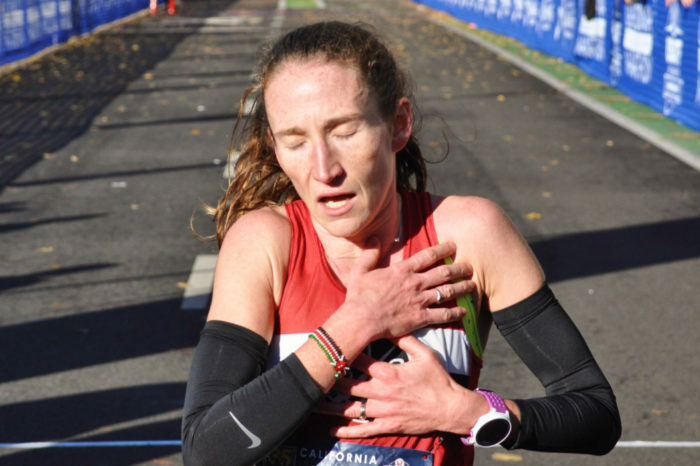 Molly Huddle, Jenny Simpson, Shalane Flanagan have shown this, as did the Deena Kastors and Lynn Jennings of yesteryear. Squire: I hear all kinds of gimmicks thrown around for bringing the elite international side of cross country back to prominence, but to me the essential and timeless parts of cross country are team competition and a difficult course. Do you have any thoughts or ideas? The IAAF is in favor, but the IOC maintains any sport for consideration must be practiced on “snow or ice”. Instead of creating an exception, the IAAF really ought to bring cross-country to a three-race “tour” of Norway, Iceland, or Switzerland in the traditional winter and spring months to officially sanction a 10K national team permit series (to supplement their current one). With drug testing and sponsorship to finance, it would meet all necessary criteria for Olympic inclusion that way, and would allow African nations to be better represented at the Winter Games. Thelma Wright of Canada agrees (she sits on the IAAF XC panel), and is pushing hard for Vancouver to host NACAC (or Pan-Am) XC first, then Worlds eventually, so it can be done. With World XC every two years now, the insertion of an Olympic XC event would catapult the sport back into the spotlight. Moreover, professional athletics could also benefit from an all-discipline sports standing, that factors trail and road performance alongside track monetary purses. That way athletes would have more of an incentive to compete in a range of races to earn coveted prizes. There is a lot that COULD be done, but many of the necessary actors to make it happen already have their hands full. Squire: Cross country is a sport in which the venue has as much or more personality as the competitors. After writing this book, is there a course that you’ve never been to that you really want to run on? Hutchinson: Holyrood Park, Edinburgh, Scotland. Or racing Wimbledon Common [London], as I’ve visited but never competed there. Squire: Final question: if you could go back in time and watch just one race which appears in your book, which one would it be? Hutchinson: Pre and Lindgren in 1969 at the first PAC-8 XC Conference Champ. The best race Garry Hill ever saw (editor of Track and Field News). Would’ve been amazing to see live.